The Cinematic M | Putting a Mark on the Film World One Day at a Time. A film consists of a series edits, even films in which there are little to no edits, (like Russian Ark for example), the mind continues to “edit” audio-visual information. As I believed I’ve touched upon earlier, it may be hard, if-not impossible to go into a film with what I would call a “blank slate”. We take information with us to the cinema whether we like it or not, and this information forms our opinion of the film. So if the individual cannot change, from left-right, up-down or center or a myriad of other combinations, how then do we provide universality to our film? Provide the “blank-slate”, or better yet, imagine a graph with an x-axis and a y-axis, these axis’ provide a structure whereby anyone with a set opinion, or schema, can chart themselves on. Now, here’s the kicker, what of the z-axis? My imagination runs wild, because I don’t think the z-axis should be finite, but infinite. If “A” is a mirror, and “B” is a mirror, and “C/A” is also a mirror, then what you have is a cinema that becomes an endless hall of mirrors. This is one possible way to achieve universality within cinema. Four people from a different planet arrive on earth. None of them have ever been exposed to apples. One is exposed to a Green Apple, another a Golden Apple, another a Figi Apple, and another, (a control subject), still hasn’t been exposed to apples. The person with the Green Apple tastes it for the first time and says, “Apples are sour.” The person with the Golden Apple says, “Apples are sweet” after tasting it for the first time. And finally the person with the Figi Apple says, “Apples are Sweet and Sour”. Again the final subject has no opinion. At the point in which these people are exposed to an outline of the structure of an apple, the person with the exposed Green Apple would say, “that is an image of something sour.” The person with the Golden Apple, when exposed to the image structure of an apple says, “this is an image of something sweet.” The person with the Figi Apple, when exposed to the image structure of an apple says, “this is an image of something both sweet and sour”. Finally the control would say, “I see this image, and it is what it is, I have no opinion as I don’t know what it is.” Or in other words the person is looking at the image without preconceived ideas. Another way to put it is: sour (1), sweet (1), both (2) or none (0). (0) seems the point of most objectivity… but how does one get there? I don’t have an answer to this at the moment. But something tells me it has to do with dealing with the structure at it’s very base. If we should have lost all our senses, and come to know the world blindly, how would we appreciate this world differently if we at some point gained our senses again? Going from nothing, to something. Or better stated, going from something, to nothing, then back to something again with renewed perspective. It’s a question I hope to answer some point in my cinematic pursuits. When I thought about creating a cinematic language, I started with thinking of cinematic variables working within the confines of “brackets” or “a screen”. Little did I know what I was investing myself, and teaching myself how to do, was the addition (for shot-to-shot, [name montage type], editing) and multiplication of sequences (or themes) in a mathematical matrix/”cinematic matrix”. What I’m discovering is that in the process of writing a cinematic language, I am borrowing elements from symbolic logic, algebra, and I’m sure a few other elements as I go along this path and course of action. I’m in the process of coming up with algebraic “terms” for techniques or “forms” and logical terminology for the distribution of “content”. I believe I’m on the right course, and I hope to proceed. And from this Middle Sequence an Ending Sequence is created. 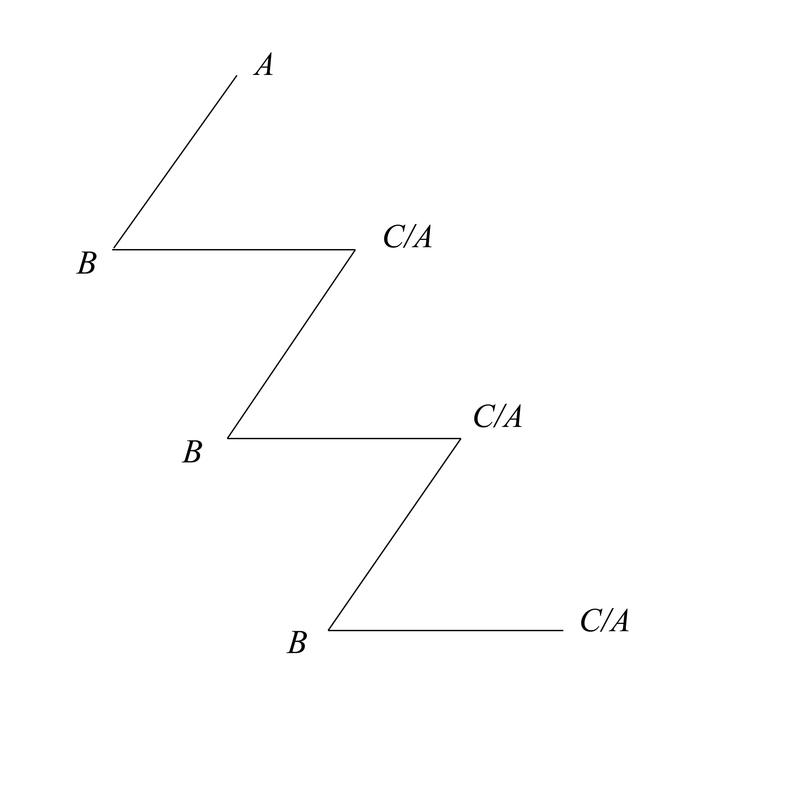 Create a paradox when all sequences follow? There must be versatility in the Narrative Variable. Beginning: Say I’m outside a room with revolving doors. As a Variable Person One walks up from the left, and in through one of the revolving doors, subsequently Variable Person Three walks out the other revolving door and exits to the right. They are both the same and not the same Person. Middle: From these revolving doors is a circular room from which Variable Person One and Variable Person Two, who is some distance ahead, hug the walls and walk clockwise back toward the revolving door. They to are both the same and not the same Person. As Variable Two Person exits room, Variable Four Person enters. Between Variable Persons One, Two, and Four, they are all the same and not the same person. Variable Four Person hugs the walls and walks clockwise with Variable Person One back toward the revolving door. End: As Variable Person One reaches revolving door, Variable Person Five enters circular room and begins to hug the walls and walk clockwise back toward the revolving door. Variable Person One once outside exits to his left. So adding to the “MacGuffin in Dualism” and the recent light shed that MacGuffins can be trigger points to infinite plot loops. I propose this, say you have two MacGuffins circling round each other, each feeding off of each other bringing themselves into their demise AND their existence, infinitely. That to me seems a concept worth investigating. Hitchcock would say, “In crook stories, it’s the necklace. In spy stories, it’s the papers.” It’s the driving force that gets the narrative going, but ultimately becomes irrelevant towards the films climax. Up until this moment, as far as I am aware, the MacGuffin has been a singular event in cinema’s narrative… but what if this device is a non-singular event? Visually we take two large orbs, one large orb is black, the other large orb is white. These two large orbs represent our MacGuffins, the central points of interest from which everything else is expanded from, and added to. What stems from these two large black and white orbs are opposing shades, counterpoints, smaller in size, but more relevant to the films overall narrative. In this way, and this way only, are the black in white points interconnected, it is by their counterpoints. So a black point, would have white counterpoints stemming from it; while the white point had black counterpoints stemming from it in inverse. I know this all sounds confusing, and might not make much sense at the moment, but allow me to illustrate it in a narrative context. Let’s alter Akira Kurosawa’s Yojimbo or, if you are unfamiliar with that narrative, imagine A Fistful of Dollars by Sergio Leone, (they are basically the same story). In these stories, you have two warring clans/families living across from one another… that is until a lone man tries to capitalize on their struggles… Ultimately though, what seems to happen when “the lone man” enters the narrative is that the MacGuffin, the plot device, ends up becoming a singular event centered around his desires to obtain cut-throat capital reward. What seems more interesting to me, is what seems to happen when “the lone man” element is taken out. What happens when we are just left with the two warring clans/families? One family has something, (a plot device, a MacGuffin), that the other family wants. These two families, and more importantly, their plot devices/MacGuffins, represent our large “white and black” points. But what of the small counterpoints stemming from the white and black points? Again, the large black point stems small white points, and the large white point stems small black points. These are ACTIONS committed by the families on one another to achieve the said plot device/MacGuffin. Ultimately, these small, counterpoint actions are more important that the “large black and white” points from which they spring. These actions, however you choose to manipulate them, will determine the course of the narrative. What’s more, since the MacGuffin seems to be a plot device that diminishes in size of importance over the course of the narrative, I’d expect it to maintain the same attributes here. So say we are producing a “warring clans/families” narrative, (without the introduction of “the lone man”), the importance by which say each clan placed value on said MacGuffin/plot device would ultimately diminish and be overshadowed by the actions committed against one another over time. This is how I see the MacGuffin working in dualism. “Hitchcockian Suspense” works in this fashion, or at least the principal of it works this way. Now, how to you take this further. I view the scenario as one with variables one with a primary action, and one with a counter action. The primary is, “two guys talking about baseball”, but the counter is, “the bomb”… but what happens when you add a larger number of counter actions? The suspense becomes even greater. Multiple knots which need to be tied in order for the primary action to resolve itself. So how would this look? Say you have a primary action, (people talking about baseball). You add a secondary “counter-action”, one of a bomb ticking down… then add another “counter-action” say of a person aware of the bomb and is running to said location to disarm it… add another “counter-action” that of someone who set up the bomb and is aware of this person’s attempt to thwart his plot… the scenario then becomes much grander, much more suspenseful. Now the audience wonders not only, “Stop talking about baseball”, but, “Will this person attempting to disarm the bomb make it in time? What happens if he/she meets up with the bomber? And if the bomber stalls him/her… what of the bomb and the two people talking about baseball?” This is how added “counter-actions” to the “primary action” add to a sense of heightened “suspenseful” emotions. More thrills. Although, I will say, at some point this idea would have a breaking point I imagine, and too many “counter-actions” would end up satirical… but that’s for another, future, investigation into this topic.